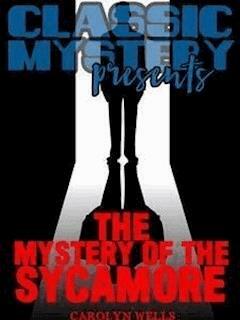 "The Mystery of the Sycamore" is an early type of detective story, falling somewhere between Conan Doyle's genius Sherlock Holmes and Hammett's tough-guy Sam Spade. It contains elements of the Gothic (the tale of the phantom bugler, which is used by the murderer as a cover) and the Golden Age puzzle.Dan Wheeler has been condemned to live his life outside of the Commonwealth of Massachusetts, as a result of his conviction for forgery, a condition imposed by the former governor of the state, Sam Appleby. Appleby has ambitions for his son to follow in his footsteps, but knows that without Wheeler's support, Appleby junior hasn't much hope. So he hopes to coerce Wheeler's support by holding out the carrot of a full pardon, which would not only allow his wife to keep her inheritance (which comes with the stipulation that she live in Massachusetts--their house is built on the border between Massachusetts and Connecticut) but free his daughter Maida to wed her beloved Jeffrey Allen, a lawyer in Boston. But Wheeler is a man of principle and refuses. Appleby has more tricks up his sleeve, however, and works his plan on Maida. He ends up shot dead in Wheeler's study, and all three Wheelers confess to the deed.